"What I have been trying to do is to color the branches of a tree according to the number of steps under parsimony that are required if certain species is attached to the corresponding branch of a backbone tree. As I am paleontologist, I usually need to place certain morphological-defined species onto a backbone constraint tree. But I could not find yet the function to do that. Any help is appreciated!" Like many such emails (unfortunately) I flagged it to (hopefully) return to later, and then I rediscovered it today. Upon closer look, my first reaction was "why do people think I know how to do these things?" As I started to respond as such, it struck me that in fact this shouldn't be that hard (thanks, in large part, to Klaus Schliep's great package phangorn). 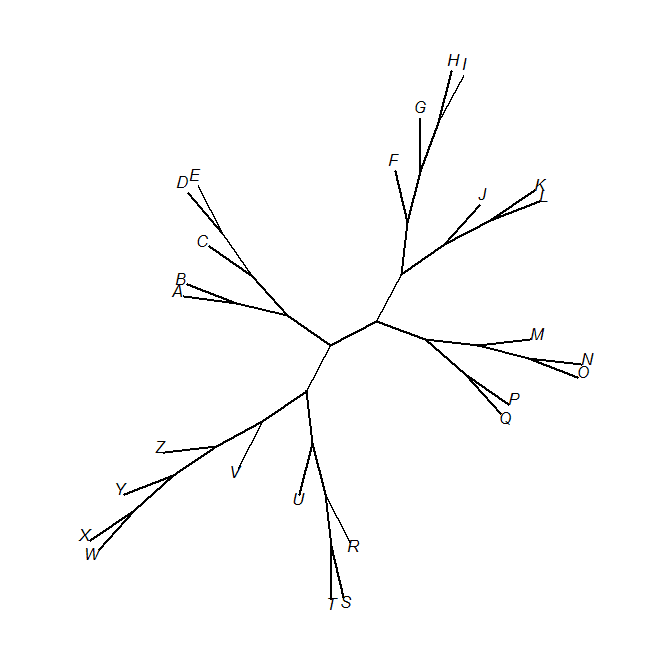 OK, now we have a data set (X) containing 26 taxa; but an unrooted tree (tree) containing only 25 tips, and we want to know (& plot) the change in parsimony score that results from attaching the one remaining tip to all of the 48 places in the tree to which it could be attached! 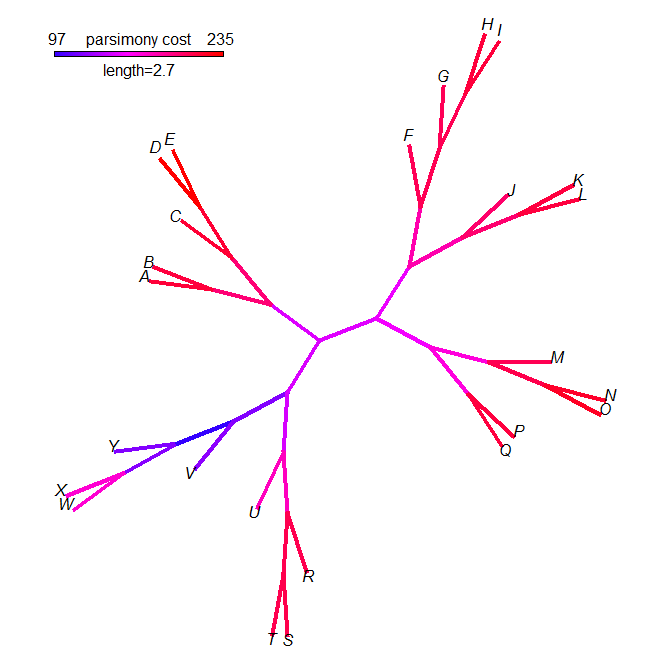 names(ps) here gives the starting & ending node numbers for each edge in the tree & ps its corresponding parsimony cost. It's pretty clear that the cost of attaching tip "Z" is indeed lowest along the edge (the internode connecting the terminal edges leading to tips "V" and "Y") where tip "Z" actually belongs. Cool. Note that if we had a model for the evolution of our characters (in this case, our data are DNA sequences - but the query pertained to morphological data from fossils so this is not guaranteed) we could easily construct a similar plot showing differences in the likelihood across the tree. That's great!! Many of us (paleontologists) have been coloring the branches of the tree manually!! Again, thanks for your time and effort (and probably love) to support open-source tools.